I had never heard of jackfruit until about six months ago. I’d seen it featured in vegan pulled “pork” sandwiches, tacos, even “pot roast” but never had a chance to taste it. A few months ago, hubby came back from the Asian market with a chunk of ripe, fresh jackfruit. It is the inspiration for Juicy Fruit gum’s flavor and was really sweet. Way to sweet to use as a meat substitute. We ate some fresh and it was OK, but not spectacular. I read that many people loved the seeds even more than the fruit, so we roasted the seeds in the oven with a little oil and salt. The seeds were fantastic! Very nutty and meaty and about the size of chestnuts. We dehydrated the remaining fresh fruit and it tasted just like sugar pop cereal. It made a great snack, but left me wanting to try the green variety. A few weeks later, we went to a restaurant that featured jackfruit tacos. They tasted amazing and we were hooked! A little later we went to a brunch that featured jackfruit pot roast. Again, we loved this funky fruit and they way it worked perfectly as a replacement for shredded meat. I just had to find some to make jackfruit recipes at home. Young, unripened jackfruit is used in recipes to replace shredded chicken, beef and pork. I finally found some canned at the Asian grocery and used it to make this super quick and easy dish. 1 20 oz. can young green jackfruit in brine or water. Take jackfruit chunks out of the can and break apart into shreds. Discard any hard pieces. Combine in pan with salsa and heat on stove. Turn heat down and place polenta slices on top or microwave to warm. 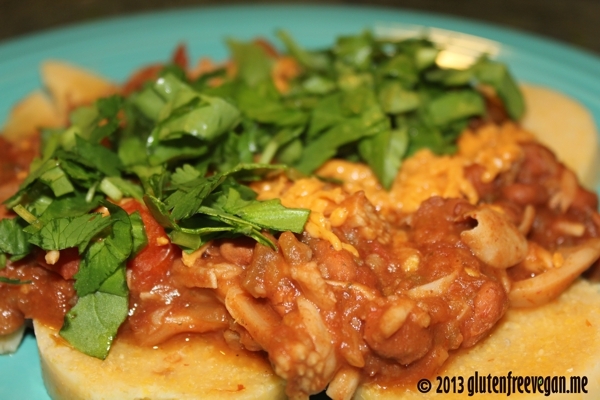 Place polenta slices on plate, top with jackfruit mixture, shredded cheese and chopped cilantro. This entry was posted in main dishes, Recipes and tagged cilantro, Daiya, gluten-free, glutenfreevegan.me, glutenfreeveganme.com, jackfruit, mexican jackfruit, polenta, vegan cooking, vegan recipes. Bookmark the permalink.